Doom 4 game - the next instalment in the extremely popular series of first-person shooters - has finally got its first short video. 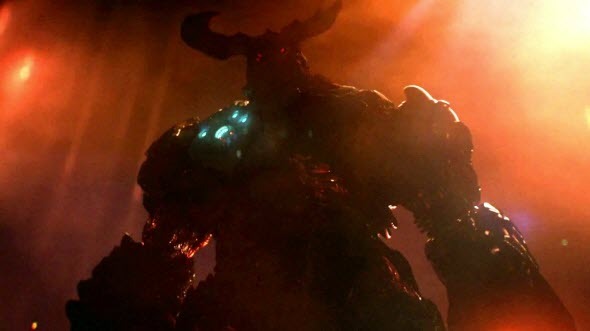 The creators of Doom franchise, as lots of other developers at E3 expo, couldn’t resist a temptation to intrigue the fans of their project and have presented the first short Doom 4 video. The fresh teaser lasts a bit more than a minute and during this short period of time shows us a scary huge monster with an extremely powerful weapon, which, obviously, will be presented in the game. Besides this creepy creature from the Hell (for sure! ), the new Doom 4 video tells us when we will be able to get to know more information about this project. According to the teaser, the developers are intented to share more game’s details pretty soon - in the middle of July - during another international event, entitled QuakeCon. This convention will be held in the period from the 17th to the 20th of July in Dallas, Texas, USA. So if you are really interested in this exciting game, then visit us in the abovementioned period. So far we suggest you watching new Doom 4 video, published below. We’d like to remind that the beta testing of this project will start till the end of the year. Those who have pre-ordered Wolfenstein: The New Order game - another project of this shooter’s publisher - will be able to take part in this test. Doom 4 game will be launched on PC, current and next-gen consoles.